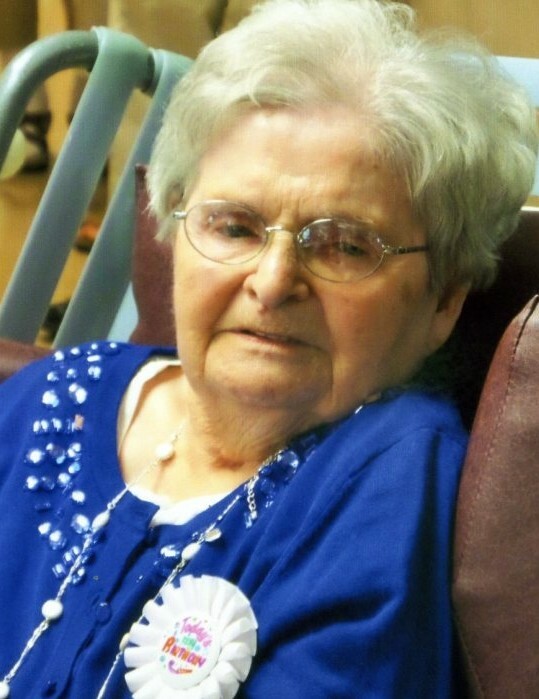 Vivianne “Vivian” Gilberte (Moreau) Guerette, 104, passed away peacefully on February 5, 2019 at Holy Cross Health Center in Manchester where the staff was devoted to her care for the last 10 years. Vivian was born on June 20, 1914 in Actonvale, Canada to the late Angeline (Tanguay) and Samuel Moreau. She was pre-deceased by her husband Roland Guerette, her eldest son, Roland L. Guerette, her seven brothers Gerard Moreau, Paul Moreau, Armand Moreau, Lucien Moreau, Bernard Moreau, Romeo Moreau, Ralph Moreau and six sisters, Jeannette Galipeault Torrey, Dolores Anctil, Julienne Cloutier, Therese Levesque, Noella Michaud, Sr. Estelle Moreau CSC, and two grandchildren, Dayna Guerette and Samuel Guerette, as well as a great-grandson, Tyler Pritchard, all of Fallon, NV. She is survived by two sisters, Sr. Angela Moreau CSC of Manchester and Sr. Laurette Moreau SJA of Quebec and sisters-in-law, Mrs. Bernard (Yvonne) Moreau and Mrs. Lucien (Alice) Moreau, both of Nashua. She leaves behind her loving and devoted daughter Jacqueline Guerette Maxwell, and three sons Emile Guerette and his wife Carolann of Fallon, NV, Arthur Guerette and his wife Anita of Hudson, and Leo Guerette and his wife Norma of Fallon, NV; seven grandchildren: Debra Wickizer of Fallon, NV, DeAnn Johnson of Spring Creek, NV, Julie Guerette of Nashua, Therese Guerette of Alexandria, VA, Karyn Robb of Gladstone, OR, Michelle Ornat of San Jose, CA, and James Maxwell of Fairfield, CA; eight great-grandchildren: Brett, Kelci and Jacob Wickizer of Fallon, NV and Garrett, Jeremy, and Colby Johnson of Spring Creek, NV and Joyce Robb and Brittany Petty of Gladstone, OR; and one great-great granddaughter, Reese Wickizer, of Fallon, NV as well as many nieces and nephews. Vivian arrived in New Hampshire from Canada with her family at the age of 9. The Moreau family grew into one of the largest families in Nashua. She attended Holy Infant Jesus School and experienced the Crown Hill Fire in 1930 and the Nashua flood in 1936. While raising her children, she worked on the housekeeping staff at Presentation of Mary Academy in Hudson. Being the oldest of 16 children, she learned to be a caregiver at a very young age, shaping who she became all her life for both her own family and the families she met at several nursing homes while working as a nurse’s aid in California, The Mary Hunt Home in Nashua and Fairview Nursing Home in Hudson. She loved spending time with her grandchildren, helping them learn to walk, and as they grew, teaching them to play cards. And, oh how they loved her “Friday night crepes,” sour cream cookies and gorton. There will be a visitation at Anctil-Rochette & Son Funeral Home, 21 Kinsley St., Nashua, NH on TUESDAY, February 12th between 2:00pm and 6:00pm. A funeral mass will be held on WEDNESDAY, February 13 at 9:30am at Holy Infant Jesus Church, 121 Allds St., Nashua, NH. Kindly meet at church. Interment will follow in St. Francis Xavier Cemetery, Nashua. The family requests in lieu of flowers that donations be made to: Sisters of the Holy Cross, 357 Island Pond Rd., Manchester, NH. The family would like to express sincere gratitude to the staff of the Holy Cross Health Center for the compassionate care given to Vivian through the years. God has called Vivian home to rest in the warmth of His love. Rest in Peace, Vivian.